For advanced screenings, exclusive news, and updates. © Untitled. All rights reserved. Images by Unsplash and Linea. COME ON AN INTIMATE JOURNEY INTO THE WORLD OF MODERN GLOBAL SHAMANISM WITH MODERN PRACTITIONERS AND SEE RARELY FILMED FOOTAGE OF ANCIENT MEDICINE PRACTICES. EACH EPISODE FOLLOWS A SPECIFIC MEDICINE PERSON WORKING WITH A SPECIFIC MEDICINE. Indigenous people across the globe have used natural and sacred Earth medicines for millennia to heal, illuminate and connect them to the web of life. From ayahuasca and San Pedro in South America, psilocybin mushrooms and Salvia Divinorum in Mexico, Peyote in North America, Kambo in Brazil, Iboga in Africa, and DMT-acacias in Australia, etc., each of these psychoactive medicines needs a healer to connect them to their patients: the shaman. This investigative-adventure documentary series examines not just these shamanic medicines, but the shamans that wield them. 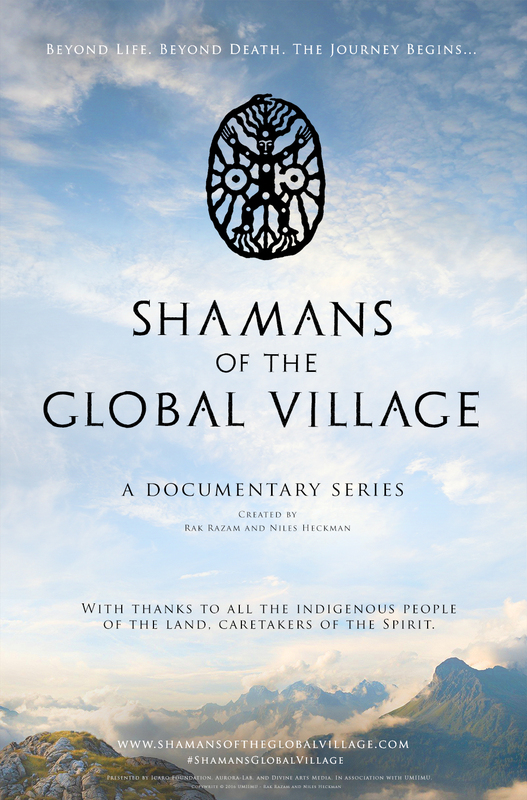 Shamans of the Global Village is unique with a focus on both indigenous and modern men and women learning to become shamans, what drives them, what their backgrounds are, and why the role of the shaman is vital in the 21st century. If, as Marshall McLuhan said, we are now a “global village”, then we need our own healers that understand the deep power and sacredness these ancient Earth medicines can reveal. Journalist Rak Razam interviews and sits in ceremony, experiencing healing medicine ceremonies with Western shamans across the globe, in countries where these plants are legal. Razam shows how the modern shamanic resurgence is being passed on from indigenous tribes to these new wave medicine people working in the Global Village, in the cities and the jungles of the 21st century. The show focuses on personalities, not just medicines, to bring alive the role of the shaman in the modern world. 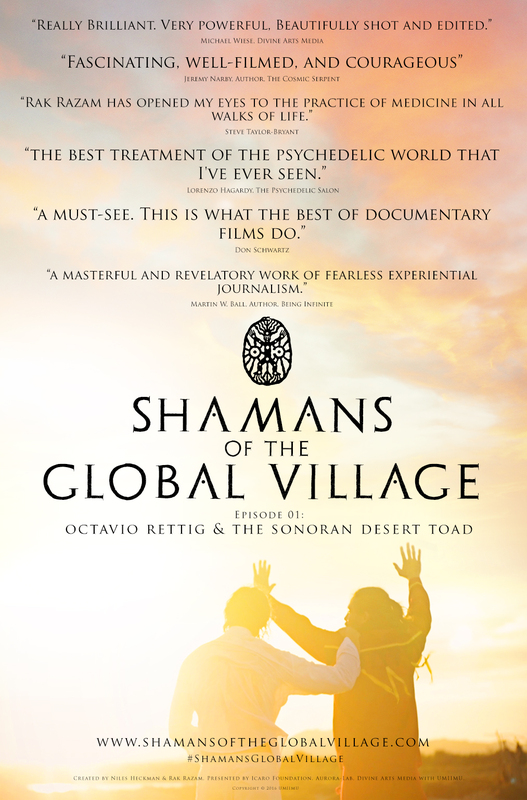 *The creators of Shamans of the Global Village do not necessarily endorse any of the practitioners featured in our shows nor are we blanketly promoting entheogenic usage. Do your research on earth medicines to see if they are right for you, and also regarding any practitioner serving them. Whilst we do research and vet people we film, reputations and practices change over time and community feedback is the best indicator of a shamanic practitioner’s integrity. We are not promoters or spokespeople, we are documentarians who are fascinated by the expansion of consciousness and our aim is to highlight that shamanism is a key component to a healthy community or civilization. Rak Razam is one of the world’s leading ‘experiential’ journalists, and author of the critically acclaimed book Aya Awakenings: A Shamanic Odyssey and the companion volume of interviews, The Ayahuasca Sessions. He is a frequent lecturer on ayahuasca and the shamanic revival sweeping the West. He wrote, produced and co-directed the groundbreaking new visionary documentary Aya: Awakenings and has been called one of the “leading spokespersons for the new paradigm”. Niles Heckman is a filmmaker with a background working in high-end commercials, games cinematics, and multiple Academy Award-winning teams in Hollywood with New Line Cinema, Warner Brothers, 20th Century Fox, and Marvel Studios. All of his independent work aims to combine high production values with occult or esoteric content. He is the co-creator of the independently produced documentary series Shamans of the Global Village and director of the feature documentary film Transmutation. The shoot for episode #2 took place in March of 2019. Details on the episode will be coming soon! Doctor Octavio Rettig is the focus of the first episode. He is a medical surgeon from the University of Guadalajara specializing in treating addictions. He has been working for over 15 years with traditional medicinal plants recognized as sacred plants or power plants within Mesoamerican cultures. He is a spokesman for the message of the councils of elders of indigenous communities in northern Mexico. He has been entrusted by the Seri tribe to communicate their message and spread their traditions and understanding. Dr. Rettig’s sessions incorporate ancient healing chants with the experience of the Sonoran Desert Toad (which contains 5-MeO-DMT). He has worked with the toad medicine for over seven years, during which he has given over 3,500 sessions treating serious cases of addiction to strong synthetic drugs like crystal meth (methamphetamine), and crack cocaine, achieving a high success rate with his patients, providing them with a new way of understanding life. Transformational healer, light worker, yogi, teacher, student, Dave Anahata lives in service to awakening truth, self realization and healing in humankind. Utilizing a fusion of modalities including yoga, meditation, breath work, Hakomi somatic therapy, and the facilitation of sacred medicines, Dave is on the forefront of consciousness exploration, employing a bold synthesis of traditions from the ancient future designed to inspire, ignite and empower. Dave places great attention on integration processes following breakthrough and transcendental experiences, emphasizing the importance of proper duty of care, support, grounding and directing of energies from these transformational experiences. Dave is dedicated to the sustainability and preservation of sacred earth medicines, the plants and animals that carry them, and their indigenous traditions as well as the continued development and evolution of sacred ceremony. Michael Wiese is a producer, director, author, and publisher. Wiese was an entertainment executive with Showtime and later Vice President of Vestron Video where he launched comedy lines with Robin Williams, Whoopi Goldberg, Billy Crystal and over 300 other videos. He was responsible for creating video lines for National Geographic, Smithsonian, NOVA and PBS. He oversees Michael Wiese Productions (MWP) which publishes a line of over 140 professional filmmaking books throughout the world.